RiskyProject is a project risk management and risk analysis software. RiskyProject is seamlessly integrated with Microsoft Project and can be also executed as a standalone application. Project managers can use RiskyProject for planning, scheduling, qualitative and quantitative risk analysis, and performance measurement. RiskyProject allows managers to determine how risks and uncertainties will affect the project. Project risk management and risk analysis for Microsoft Project and standalone. ...... separate task or resource. You also can define distributions for task duration, cost, start and finish times. This information, together with the project schedule, is used in the risk analysis using Monte Carlo simulations. 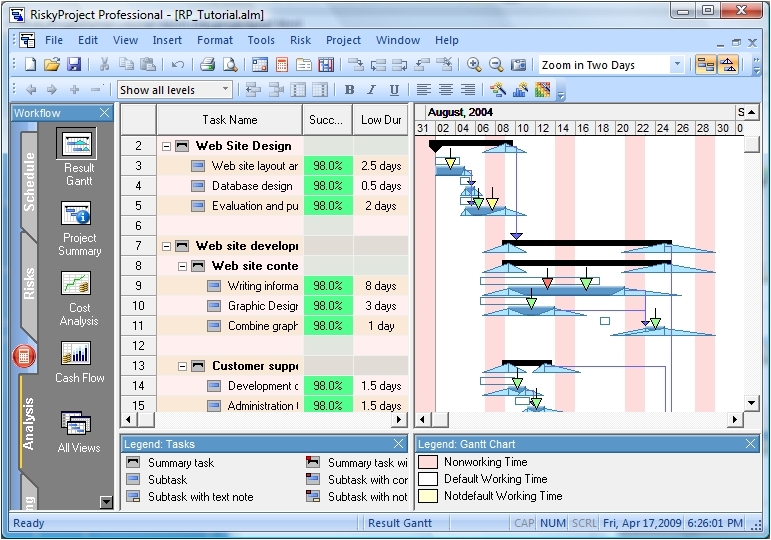 RiskyProject presents you with Risk-aware Gantt Chart uncertainties in task duration, start and finish times are shown graphically in a special Gantt Chart. RiskyProject also helps you to track the project with risks and uncertainties. RiskyProject uses Risk Register to manage risks: open and close risks, assign risk properties, convert risk to issues, and rank risks based on their probability, impact, and score. Full control of your projects from order to invoice. Free in 3 active projects. Complete project management solution for planning and managing any project. Download a Project Management Process to help you manage projects successfully. Project Management Methodology Software and Processes for Project Managers. Qweas is providing links to RiskyProject 5.0 as a courtesy, and makes no representations regarding RiskyProject or any other applications or any information related thereto. Any questions, complaints or claims regarding this application RiskyProject 5.0 must be directed to the appropriate software vendor. You may click the publisher link of RiskyProject on the top of this page to get more details about the vendor.